I wanted it to be easy to pull out and set up using only one hand, so I can lean on the bed with the other hand. Anyone with back problems will immediately recognize how valuable that is. The shopping list is simple, with the lumber cost starting around $12, although you may want to spend a little more to get a better grade (you will use every inch of the 1×6, and only waste a couple inches of the other boards). Add a pair of hinges, a box of screws, and probably some foot pad gliders, and you might be in the $25 to $30 range. You may also want to glue or tack some carpet or upholstery to the steps for better traction. With the foot pads it measures 19.5″ tall, with a 6.5″ step height, making it an ideal match for a 26″ bed height. No special tools are required, just a saw and a drill. You could use a Kreg jig, but I think it would be stronger to screw strait through the side panels. A miter saw is helpful on the right angles, but it is only useful on one end of side rails–the 40 degree angle, since the top end is 50 degrees off of a right angle, and most miter saws won’t go that far. 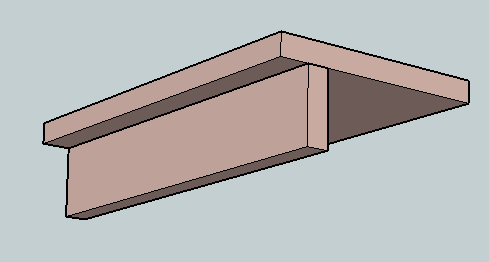 The hinges will be under load when the weight is on the top step, so bigger hinges will provide greater weight capacity. Pre-drill the box front piece with 2 holes at each end, 3/8″ from the end, and about 3/4″ from each edge. Pre-drill the side pieces with 2 holes each for the back and mid pieces as shown. Assemble the box with the front piece attached to the ends of the side pieces, and the mid and back pieces in between the sides. 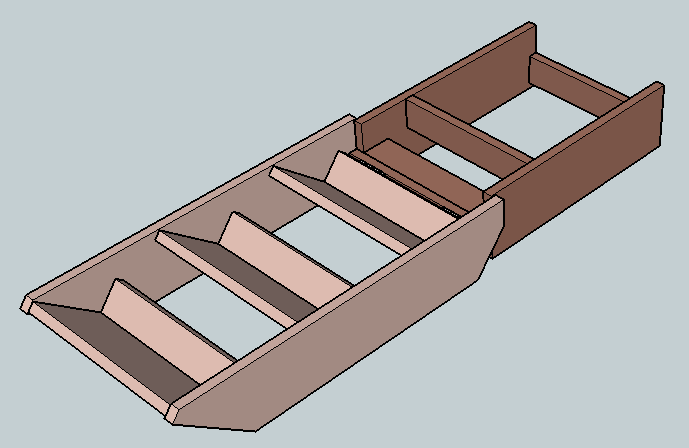 One of the middle pieces should be installed horizontally, aligned with the front end of the side pieces, against the back of the front piece for reinforcement. The other mid piece should be 4.5″ back from the front edge of the side pieces. 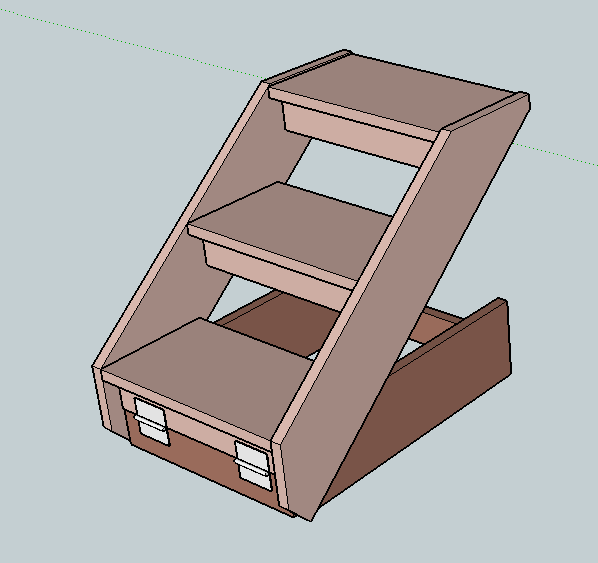 Next, attach the step supports to steps. Drill through the steps, 1 3/8″ from the front edge and from each end. Attach the step support 1″ back from the front edge, using glue and screws. Measure and cut the stair sides as shown. 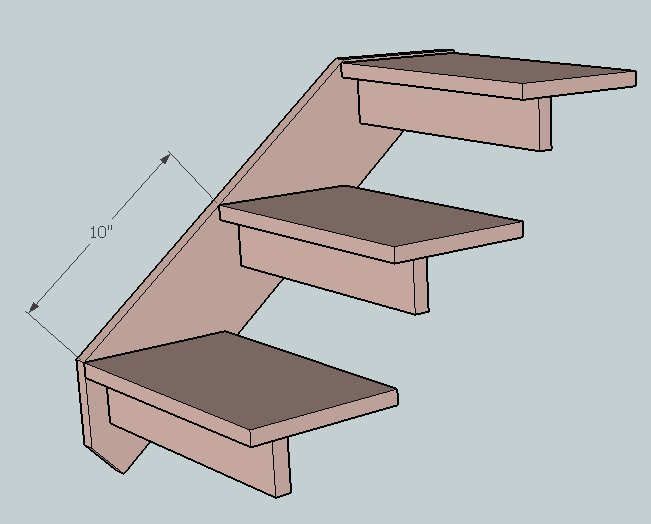 The stairs will sit at a 40 degree angle. Mark the location of the steps on the side rails. The front edge of the steps should be 10″ apart, and if your 1x8s are 7 1/2″, they will reach from edge to edge of the 1×6 (if they only measure 7 1/4″, there will be a small gap at the back, or bottom edge). The top step should be about 1/8″ below the top edge of the rails (this will hide the edge of a carpet pad if you cover the steps). Pre-drill holes in the side rails to align with both the step and the step support, with 2 screws into the step and one into the support. The bottom step is critical to the strength of the stairs, so you may want an extra screw in that one. Attach all 3 steps to one side rail, using liberal glue and screws. Then attach the other side rail (if you attempt to squeeze one in after attaching both sides, you can’t spread the glue properly). 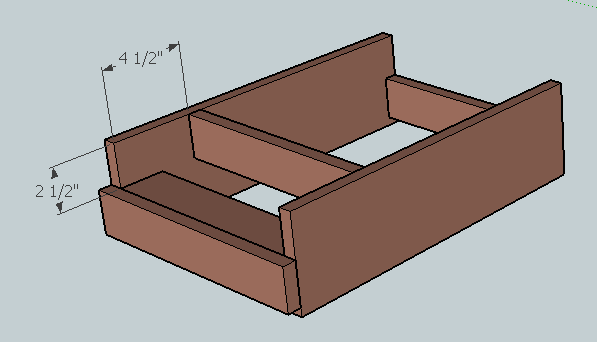 Attach the foot glides to the bottom rails of the box so it will slide more easily under the bed. Set the two pieces in the final position to align the hinges. There should be a 1/8″ gap on either side of the box. Mark the holes, pre-drill, and attach. You can download the Sketchup file to view it in more detail. I cant seem to download the sketchup link. Any suggestions? ?